Herb growing is an up-and-coming industry these days, but years ago the Arrow Lakes had its own flourishing herbal business. Its owner was one of the area’s most enterprising and interesting women. Estella M. Hartt was born in Kingsclear, New Brunswick on March 20, 1876. She completed her schooling and normal school training in New Brunswick and was one of six teachers chosen to attend a three month course in Nature and Science in Guelph, Ontario, at the turn of the century. After the First World War, Miss Hartt taught school in Saskatchewan, where she became a well-known commercial teacher in the Success-Garbutt Business College circles. Later, she became principal of the Weyburn Success College. Hartt retired in 1928 to care for her aging mother and came to the Arrow Lakes, where she purchased property at Bird’s Landing. She had the soil of her property analyzed and found the soil suitable for growing ginseng and goldenseal. Cultivating these herbs, she developed a thriving business and was successful in finding European markets by shipping through the Botanical Gardens in Cincinatti and New York. Estella Hartt on Stone Boat, on her property. Circa 1928. Ginseng and Goldenseal require shade to grow well, so she built waist-high fences and covered them with shakes. While the herbs were growing, Hartt planted varieties of walnut and hazelnut trees around her garden. When they were able to provide the shade required by the herbs, she removed the fences. After a time, the herbs were replaced by a synthetic product and the market diminished. However, Hartt managed to keep her mother, her uncle and herself on her sales. 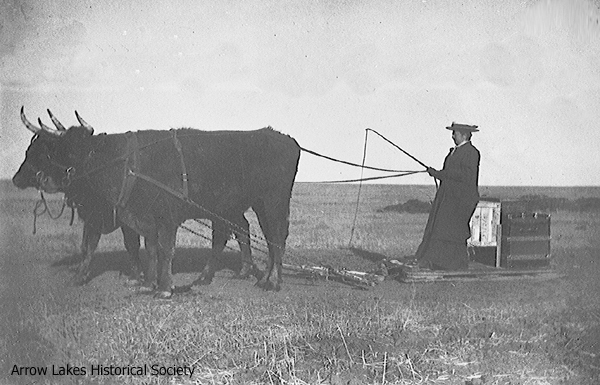 She also helped to support the Three Hills Missionary School in Saskatchewan, which was a favorite charity of hers. Her mother passed away in 1935 and her uncle in 1942. She continued to live alone until BC Hydro purchased her property in 1962. She then moved to Kaleden, near Penticton, and made her home with two close friends from her Weyburn College days. Hartt is remembered for her hospitality and strength of character. She was interested in woodwork, taxidermy and nature study. Her collections of butterflies and insects ere beautifully mounted. She also had hundreds of specimens of prairie flowers and herbs, which were all botanically classified to make exceptional collections. She was noted for her beautiful penmanship, Old English writing, pen and ink etchings and oil paintings. Pat Philcox, a pioneer of Bird’s Landing, remembers Hartt well because her family visited in the summers on a property close to hers. She gave marvelous dinners on beautiful English china and read Bible stories to the children. 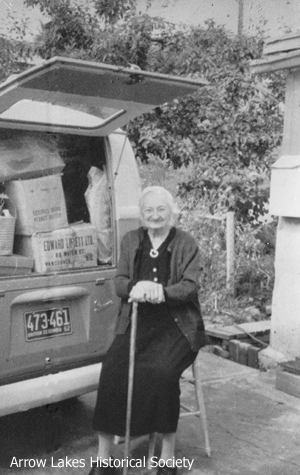 Estella Hartt proved to be an entrepreneur extraodinaire at a time when women usually only entered into nursing and teaching professions. What is more, she did it with flair.